Coasteering is a new adventure-activity, derived from canyoning, which perfectly combines cliff jumping, swimming, abseiling and climbing. Bursting with fun and adventure, this sport stands out because of its jumps from the rocks the fact that it can be practiced in the ocean, not only in white water. 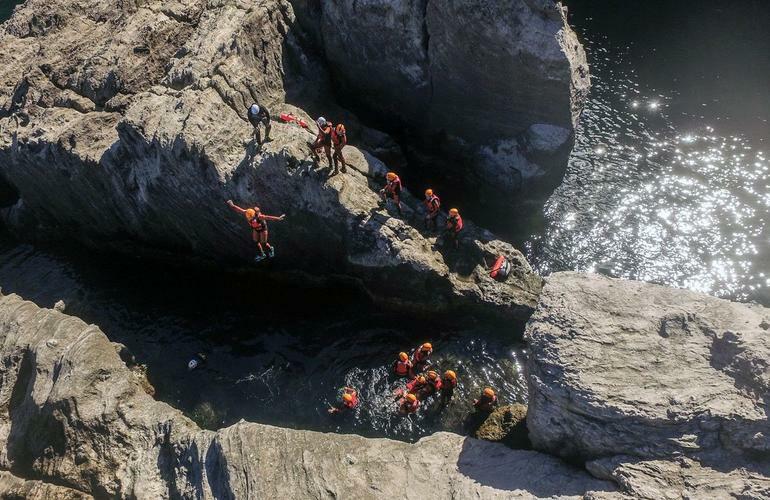 Coastal canyoning is a discipline that comes from the British Isles, designed to let you discover nature along the coast and in places that are often difficult to access. It’s also an opportunity to discover the history of exceptional cliff formations and to know a little more about these slightly terrestrial paradises. Coasteering unique nature requires all adventurers to be extremely respectful of the environment, as you evolve on the route using only on natural elements. 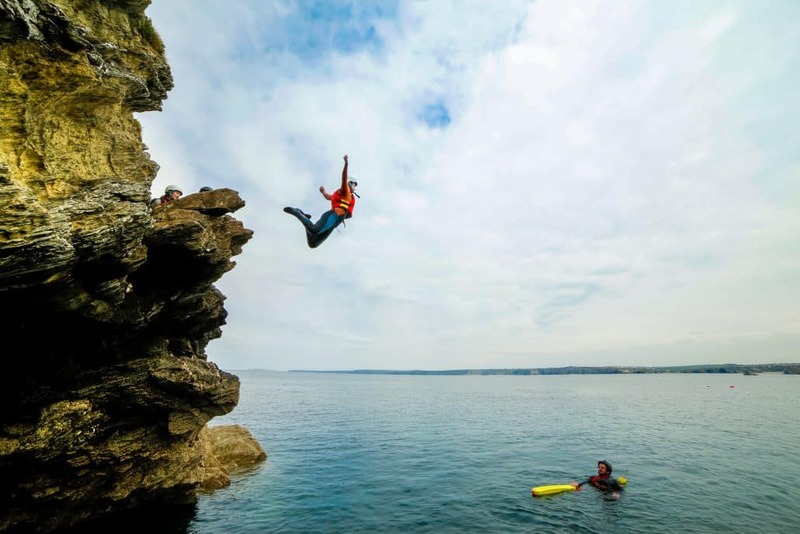 In this article we explore some of the most beautiful coasteering spots in Europe which make for an unforgettable day out with family or friends. Head to the Balearic Islands in the Mediterranean and check out one of the most paradisiacal Spanish islands. Mallorca is renowned for its incredible seaside resorts, protected coves, limestone mountains and Roman ruins. There are countless adventures to be had in Mallorca but fitting in time to go coasteering is an absolute must in thes idyllic location. Choose between one of the four coasteering sites of the island: Alcudia, Cala Romantica, Magaluf and Paguera, bearing in mind the weather conditions and your level of competence. Venture into this exciting new activity and get ready full dose of adrenaline. Explore the Irish coast from a different perspective and discover the Wild Atlantic Way. 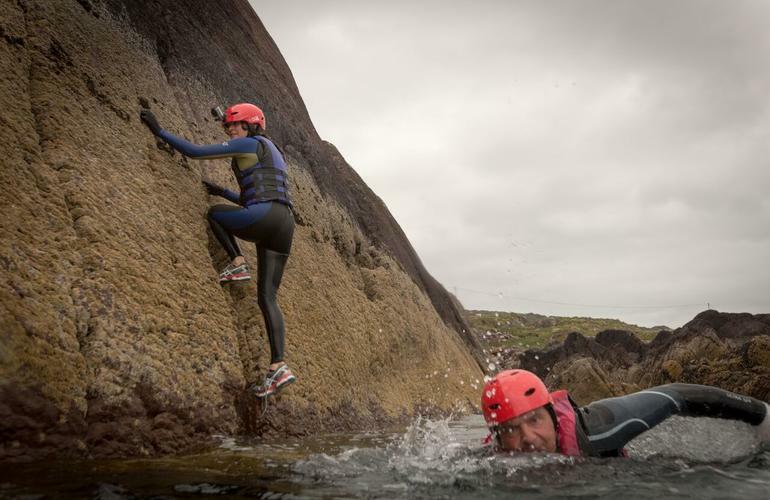 Jump, swim and climb with the highly experienced specialists in coasteering and hiking in Ireland who will guide you along the incessant swell of the Atlantic. Some jumps even tower at 15-metres high! The Iveragh and Beara Peninsula coast in southwestern Ireland is one of the most beautiful and picturesque regions in the country, so zip up your wetsuit and put on your helmet and set off on a wild Irish adventure! The largest Greek island, Crete, is a sure-fire paradise for nature lovers. Home to immense sandy beaches like Elafonisi, mountainous reliefs like Mount Ida and even the cave of Ideon where Zeus was born according to Greek mythology. 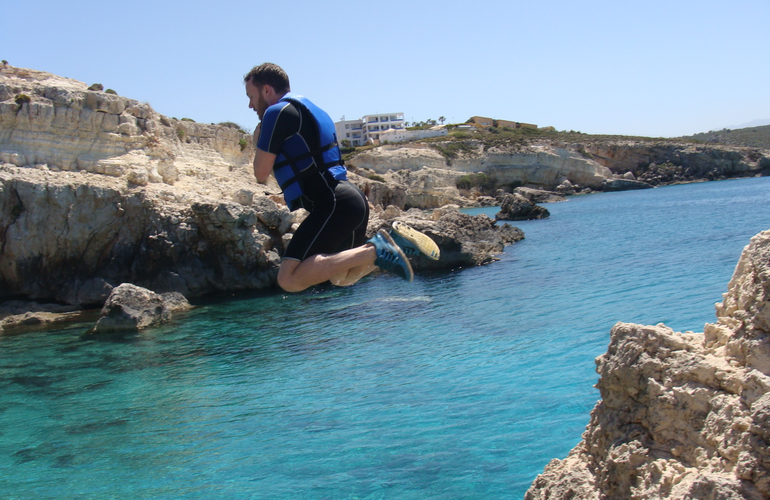 Get your coasteering gear on and explore hidden and seemingly inaccessible places, jump off the Cretan coast and be blown away with the beauty hiding around every corner. Set out on a 3-hour session during which you can swim, cliff dive, explore hidden coves, leap across rocks and even learn a little geology. If you’re feeling extra adventurous, the route can always be changed to suit your skill level and keep your adrenalin levels topped up. This wonderful sport of coasteering really allows you to see areas of a coastline that you would otherwise have no chance of accessing and experience the power and challenges on nature in a unique way. There is no better way to discover the natural beauty of Lisbons surroundings than via the coasts and by mixing in some swimming, climbing and cliff jumping. Coasteering is becoming one of the most popular water activities in the Arrabiada Natural Park, as it lets you experience the wild coast of Sesimbra in an exhilarating way that leaves you feeling pumped up and inspired. In addition, it’s easily on of the most dynamic, yet accessible, ways to explore and enjoy the beauty of the coastline. Imagine exploring the ravines on the edge of the European continent. 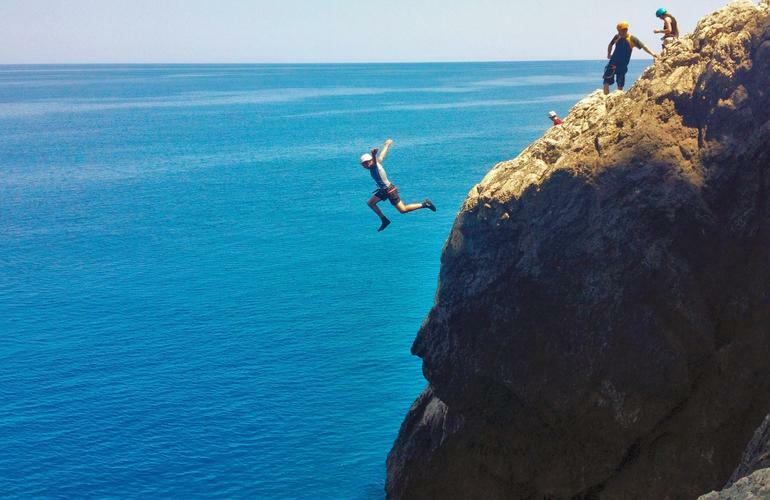 Take a trip around Isla Plana in Murcia via the coasteering route and find yourself jumping in the sea, climbing and even diving through this extreme outdoor activity. Feel your heart race as you discover the hidden corners of Isla Plana that aren’t accessible by any conventional means. 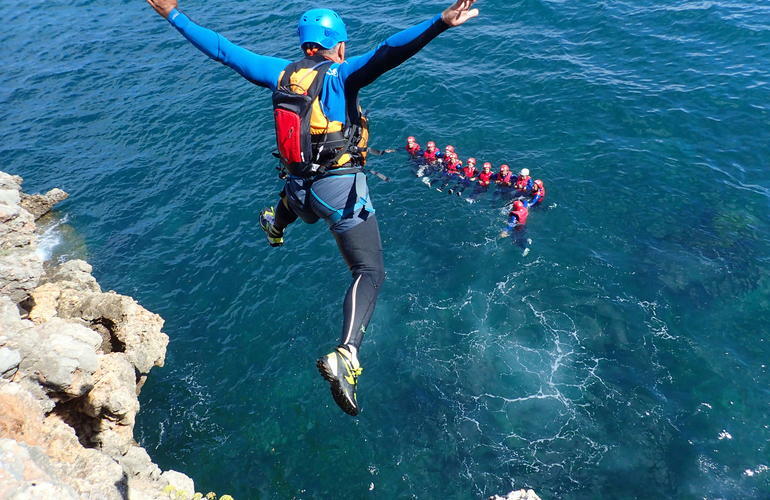 Coasteering is more than just a hobby, or an excursion, it’s a real challenge where every step will push you to the limit and teach you things you never thought you would need to know! The steep coast of Sao Miguel island in the Azores archipelago, is the ideal playground for outdoor activities. 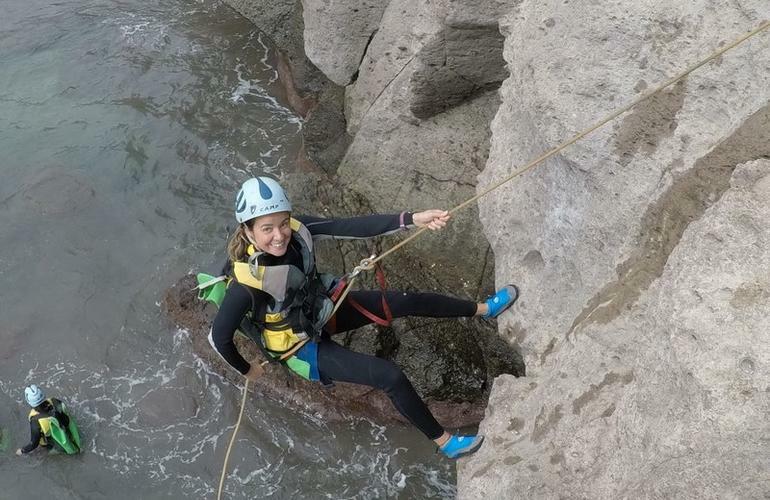 Exploring the beautiful coast of São Miguel through a coasteering adventure, that lets you discover all the nooks and crannies of the impressive cliffs, is the best way to do it. After meeting your guide and putting on your gear, head out to one of the three coasteering zones that will be chosen for you according to the weather conditions. 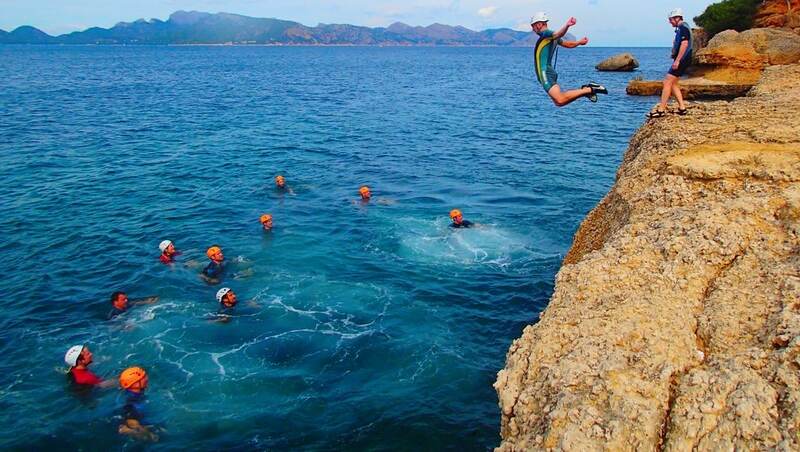 Rest assured, no matter which one you choose, you’ll be testing your nerve with climbing, jumping and swimming all the way along the coast! 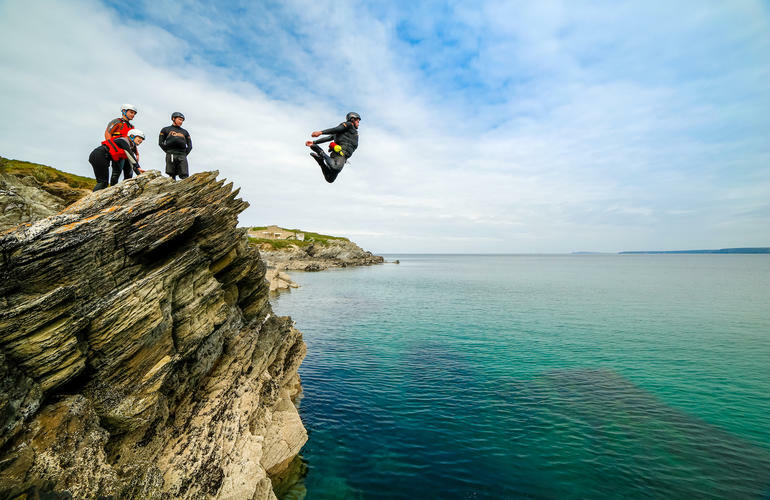 Coasteering is a new and adventurer-approved adrenaline rush that can be found in Cornwall, it’s accessible to all and is truly the best way to discover the coast of Newquay in the South West of England. Negotiate whirlpools, rock structures and jump of rocks into deep pools of water, whilst in-between, discover the caves of smugglers and learning the history of this majestic coast. You’ll be guided by experts all the time whose task is to keep you safe while showing you the most thrilling way along one of the UK’s extreme coastlines. The southern end of Gran Canaria has a rugged coastline with towering cliffs that are perfect for a day of coasteering. One of the most diverse, fun and original outdoor activities you’ll find in the Canary Islands, which offers you the chance to jump into the water from different heights and get a fresh dose of adrenaline. On the side of Puerto de Mogán, shoot down a zip line that crosses a cave and ends in the sea with a breath-taking view, eventually leading you to a short Via Ferrata along the cliffs just to top it off. Feel the thrill of the waves dramatically crashing just below your feet on, what promises to be, an unforgettable day. 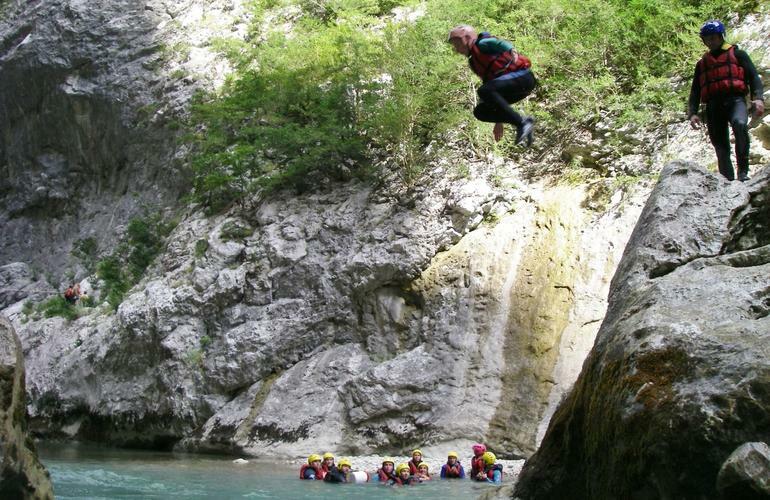 France is a land rich in gorges, canyons and streams, which in turn means there are an abundance of spots to try out coasteering whether you’re in Normandy (Channel), Brittany or further south. We have selected the Gours du Ray canyon, in the Gorges du Loup, located in the Verdon Regional Nature Park about one hour above Nice. In the middle of a wooded valley in the high valley of the Loup (wolf), this canyon is the perfect place to try out coasteering with an initiation on abseiling and several jumps into the sumptuous deep basins from 2 to 8 metres up. 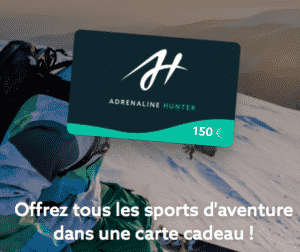 This route offers a varied landscape and greenery, but as we mentioned, this is just one example of many and you will have no trouble finding a spot to test this thrill-inducing sport in France. 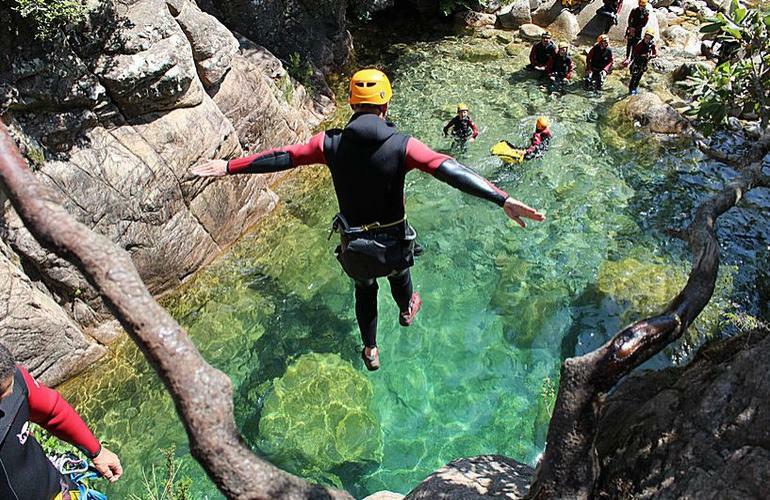 Explore the shores and hidey-holes on the island of Corsica and marvel at the beauty through a multitude of adrenalin-filled coasteering routes. In addition to a panoramic view that will leave you speechless, explore the creeks and climb the cliffs before free-falling on the big dive. Your biggest problem will be choosing which is the best place to try the coastal cayoning as the whole island offers different spots to discover, whether you are near Calacuccia, Corte, Bavella or Ajaccio. One thing we can promise though, you’ll never be disappointed with any place you decide to embark on your one-of-a-kind extreme adventure.